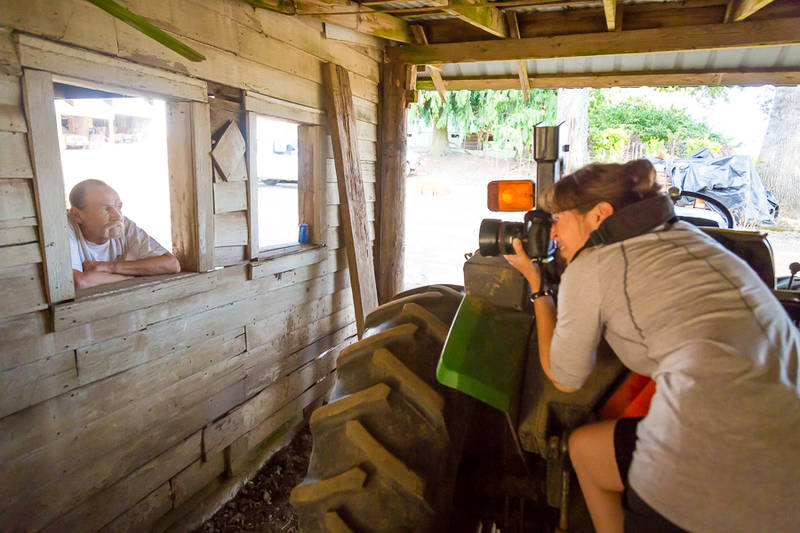 This week I was assigned by The New York Times to make an environmental portrait of a man in Yamhill, Oregon for a piece written by Nickolas Kristof, one of the Op-Ed columnists for the paper. My assignment was to cover a story called, “Inheriting a Hard Life,” and Rick Goff was the subject on which the premise of the article was based. My missive from the photo editor was to, “think Dorothea Lange in color.” The late Dorothea Lange is famous for her work as a FSA photographer, most notably for her image, “Migrant Mother.” So with some ideas swirling around in my brain, we hopped in the car and bee lined it to Yamhill because the deadline was virtually the same day we had to shoot. We arrived at the location and Rick was ready for us. He had apparently already received a copy of the story and was prepared to start shooting. We spent about an hour working on trying to make some images that best illustrated the point – an attractive portrait in an environment that was a working man’s setting. Rick was in charge of expression. He already knew that this wasn’t necessarily a happy story. He was really good at facing the camera which made our shoot go very smoothly. We worked in several locations and as we were wrapping up, I noticed these great windows. Since the picture had to be in color and Ms. Lange’s images are all black and white I decided to work with the window area because the colors were very muted. The wood facade, the window frame, the background and Rick’s posture all came together. I instantly knew that this was the image they would run. It’s in today’s New York Times, and although it’s color, it’s very monochromatic. I’m pleased with the way the image turned out and, as usual, extremely happy to continue to receive interesting assignments from the Times. Here are a few outtakes as well as some behind the scenes pictures. 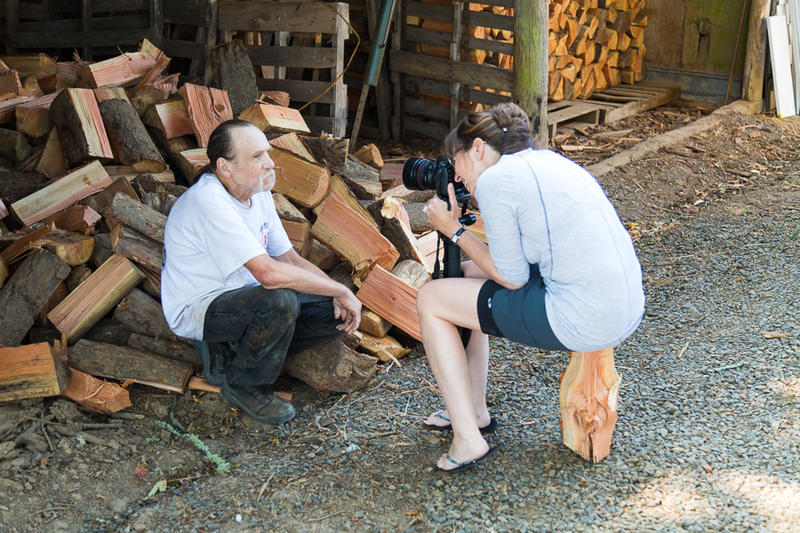 On assignment for the New York Times, using a log chair. Last year, I was lucky enough to be assigned to photograph two of the 2012 Travelers of the Year for National Geographic Traveler Magazine. I wrote about it in a previous post, and a lot of what I said then remains the same today. The most interesting part of my job is having the privilege to meet and photograph many interesting people. This year was no exception. The stars aligned and it turned out that two of the nominees happened to be in my hometown of Portland, Oregon, so I ended up photographing two of the 2013 Travelers of the Year for National Geographic Traveler Magazine. The first assignment was to photograph a couple – Seth McBride and Kelly Schwan who were preparing to leave on a year-long, 10,000-mile bicycle adventure from Portland, Oregon to Patagonia in Argentina. The most amazing part of their story is that Seth has quadriplegia and must travel using a hand-cycle. Meeting and working with these two was incredibly inspiring. We tried a couple of different approaches to making pictures of them and both of the locations ended up in the story – in print and on the web. The print version (below) shows Seth and Kelly biking on a country road outside of Portland. We got the shot by hiring a truck so I could make pictures of them while they were cycling, which was a great way to illustrate in picture precisely what they are about. You can follow them on their epic journey online via their blog, www.longroadsouth.com. The second photo-op turned out to be another couple who are referred to in the article as the, “New Pioneers,” and their portrait ended up being the opener for the print version of the story (see below). John Ellis and Laura Preston ditched their jobs in New York City, got an airstream trailer and started on a journey that seems to keep on going. They “crowd-source” their itinerary and wound up just outside of Portland in a small trailer park along the river. John and Laura are taking advantage of being able to do their jobs on the road – they are both web developers – so they can work while exploring America. It’s an inspiring story, filled with the romance of chasing dreams while traveling and earning a living. You can follow their journey online at www.thedemocratictravelers.com.